Erika Napoletano is someone I stumbled upon a few years ago – don’t ask me how, I have no clue. I subscribe to her blog – I don’t read it often, but they all still live in my inbox. I love her work because she talks straight, thinks along the same lines I do, and throws in swear words because that’s just her style. In my various web wanderings, I’ll clip articles that catch my fancy to Evernote so that I can blog about them later. Today, the two came together. 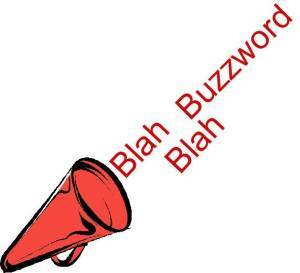 I decided for this blog to take on one of my clippings from several months ago: 5 Buzzwords You Need to Stop Using Now. I’m all for the banning of buzzwords. If I noticed that Erika Napoletano (aka Redhead Writing) was the author, I didn’t save that piece of information, so it was a pleasant surprise to see her byline when I opened up the article. Erika (Ms. Napoletano just seems so wrong) selected overarching, disrupt, engagement, ROI, and platform as her nasty words. She argued each one very clearly and, I have to say, she “chose wisely.” Admittedly, “platform” and “disrupt” haven’t hit my radar, but they are sure to bug me from now on. Another good point made is that, at times, a buzzword meaning does not come close to the dictionary meaning – a great annoyance to many a Word Nerd. A point I wish she made is that over-use of buzzwords makes people sound stupid. Personally, I think that over-use by the inadequately educated is what takes an industry term to buzzword. Let’s take ROI (Return on Investment) as an example. This buzzword hit me square in the face long before I considered going into business for myself. I was at a conference giving software demonstrations and suddenly I couldn’t get away from it. Even when one client quietly told me what ROI meant, I still didn’t get it. But everyone was using it. At some point, only accountants referred to making money back as a “return on investment.” As an accounting term, I’m sure ROI became shorthand for other accountants. But then, someone – probably wanting to look good in front of the boss – picked up the term, used it to death, and turned it into the buzzword we all know and hate today. And, by the way, the fact that our language is a living – evolving – thing is no excuse to sound like an idiot.